We in the iPhone development community face a rather large conundrum when it comes to blogs: we’d love to share what we’re finding out about this new platform, but are shackled in what we can say by the ongoing NDA covering all discussion. 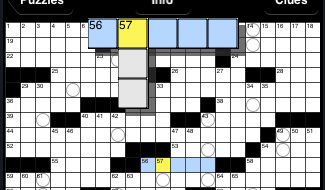 Given this constraint, I decided I’d talk about the design decisions we made in putting together Crosswords for the iPhone, rather than the underlying code (which hopefully I’ll talk about in a future, post-NDA entry). 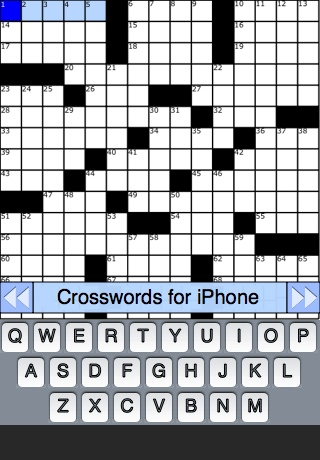 Just before the iPhone was released, we started work on a browser version of Crosswords. This gave us a good test-bed to work on some screen layout concepts, but the project never really got very far due to limitations in the iPhone version of Safari (specifically, there was no way to track a finger as it was dragged from square to square, which meant precise position of the ‘cursor’ was not possible). With the release of the unofficial toolchain SDK in the fall of 2007, we decided a new approach was in order. Building off the design of the web version, we were able to add a good deal of functionality and usability to the design. Native controls allowed for faster display and more responsiveness, as well as an overall better feel. With the release of the SDK came the much anticipated documentation. Finally we could get some sort of official word on the classes and method we were using (with the Jailbreak toolchain, all information available had been gleaned from trial-and-error, and was frequently incomplete). Of course, the SDK required an almost complete rewrite of the application, so we took the opportunity to polish both the code and the user interface. We moved some elements around on screen, trying to find the best layout that maximized puzzle access while still allowing the user to use the keyboard and see clues. 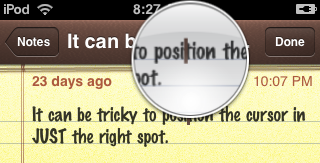 This has the advantage of allowing the user to focus on just the area where they’d want to enter letters, and position their selection precisely. 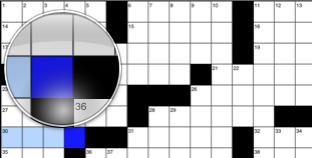 However, it’s certainly not as aesthetically pleasing as the loupe, and gives no information about adjacent squares. This was used in the 1.0 release of the software, but we weren’t 100% happy with it. One the left, the Jailbreak toolchain version, In the middle, our first attempt with the SDK, and on the right, the finished product, after a UI review with Apple and some refinement following a lot of user testing. With the 1.0 release, we’ve pretty much settled on an overall layout for the application, but we’re still refining the feel of certain features. For example, as mentioned earlier, we weren’t really satisfied with the experience of the zoomed-in clues; with the version 1.1 release, we’ve returned to the zoom loupe, and feel it works well. You are currently browsing the The Handheld Mac weblog archives for July, 2008.